The April Flores Designer Toy! 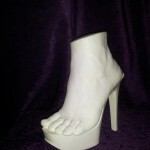 An exact replica of April Flores’ beautiful and intoxicating foot, resting in the palm of your hand. Run your fingers over the curve of her soft heel and down across her pretty candied colored toenails. A mirror image and anatomically correct, it’s almost as if you’re giving April one of your famous foot rubs in the privacy of your own home. Custom made in Hollywood by C. Batts FLY.